Spinal cord injury victims can have their lives changed in an instant from their accidents. In serious cases, injuries to the spine can result in becoming paralyzed. At the hospital, doctors need to act quickly to gauge how serious the injury is. Medical professionals classify spinal cord injuries as complete or incomplete. Incomplete Injury: The ability of the spinal cord to convey messages to and from the brain hasn't been completely lost. People with these injuries retain some motor & sensory functions below the injury. Complete Injury: There is a complete lack of sensory and motor function below the level of the injury. Spinal injuries are classified as paraplegia or quadriplegia depending on the location along the spine of where the injury has occurred. For paraplegia, injury damage happens below the neck. 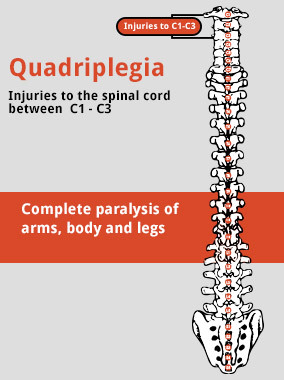 For quadriplegia, damage happens to the spinal cord at the base of the skull or the neck. With a spinal cord injury, medical staff have to move quickly to stabilize the patient. Immediate treatment can include bracing the spine to stop it from moving and further injuring the spinal cord. Steroids and other medications can also be used to help lessen damage to nerves and other nearby tissue. Recovery and rehabilitation occurs after everything else has been diagnosed and addressed. Any other treatments are dependent on the type and severity of the spinal injury, but can include medications, surgery, physical therapy and counseling. 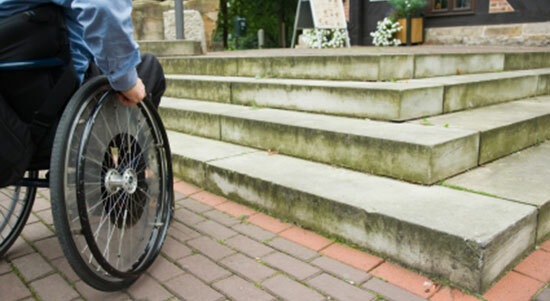 Spinal cord injuries are devastating for the victims and their immediate family members. Life doesn't look the same after an accident leaves you paralyzed. Spinal cord injury cases are some of the most serious and difficult cases to navigate. That's why Edgar Snyder & Associates should be your first call for legal help. Our experienced attorneys have the knowledge and the resources to hire experts and gather every bit of evidence to build your spinal injury case. From beginning to end, we keep you informed on progress of the case and we answer all of your questions quickly, without the legal jargon. You have enough on your mind with recovery, rehabilitation and getting back to the quality of life you deserve. Let us take care of the rest. When a person suffers a spinal cord injury in an accident that wasn't his or her fault, there are many factors that can make the case complicated. Diagnosing and gauging how serious of an injury a victim has requires a highly specialized team of physicians and medical staff. That means a large number of medical bills right from the start. 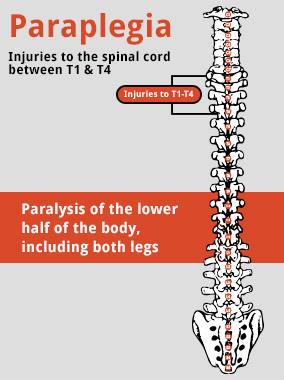 If the patient's spinal cord injury is severe, they will likely have a lengthy stay in the hospital. Months can go by with nurses and other medical stuff constantly monitoring around the clock. Meanwhile, evidence from the accident – no matter what type of accident it was – disappears quickly. You may not be concerned about anything but the health of your loved one, but losing evidence makes a case harder to prove. Then, your loved one may move to a rehabilitation center. Rehabilitation can last from weeks to months – and the costs add up quickly. You also will need to think about the effects the spinal cord injury will have on your loved one's life and family. They may not be able to work the same job they used to work, or maybe they'll never work again. You may need to renovate the house or purchase adaptive equipment so they can live at home. They may need to apply for Social Security disability benefits. Perhaps one of the hardest parts about spinal cord injury cases is that it's hard to predict the amount and type of medical care your loved one will need in the future. While specialists are very good at diagnosing and treating spinal cord injuries, it's hard to foresee future medical complications. While you're faced with all of these obstacles, the insurance company that covers the person or business at fault for the accident will try to offer you the lowest settlement possible. The insurance company may make you an offer that seems like a lot of money. But, with the amount of medical bills associated with serious spinal cord injuries, the offer may not even cover the initial hospital stay. They may argue your loved one isn't as injured as they truly are. Or, they may drag you through lengthy court battles to delay giving you the money you may desperately need. The bottom line – you need an experienced attorney who knows what fair compensation means for spinal cord injury survivors, and who has the resources to prove your case. At Edgar Snyder & Associates, we will fight to get you the maximum amount of money possible for your spinal cord injury. We can't erase what happened to you, but we can help ease the financial burden on you and your family – so that you can afford proper health care and medical equipment for the future. Contact Edgar Snyder & Associates today. Call 1-866-943-3427, or fill out the form at the top right of the webpage. It's absolutely free, and there's no obligation to use our services. You have nothing to lose and everything to gain. Our phones answer 24/7, so get started today with a free case review.